This page is dedicated to René Lacoste, one of the most prolific tennis players in the tennis history who was born 110 years ago. Here we remember the tennis player, the inventor, the innovator and brand-founder, fashion-designer recalling some various moments of his life. His full-name was Jean Rene Lacoste. He was born on July 2, 1904 in Paris, France. He was a good student with a mind for mechanical things. He had been set to enroll at a prestigious French engineering school. Lacoste came to the sport of tennis relatively late in life. He was already 15 years old and visiting England with his father, a wealthy businessman, when he first started playing. While never considered a tremendous athlete, Lacoste built his game from the court's baseline, keeping his opponents on the move with an arsenal of precise groundstrokes. He established himself as one of The Four Musketeers with Henri Cochet, Jean Borotra and Jacques Brugnon. His nickname was „The Crocodile” by fans because of his tenacity on the court. René Lacoste was a finest French tennis player whose dominance in the 1920s and early 1930s was unquestionable. In 1924,he won a bronze medal in men’s doubles competition, at the Olympic Games in Paris. His breakthrough year came in 1925, when he captured the Championnat de France and the Wimbledon singles championships. His victory in the US Open final in 1927, when he was just 22 years old, 12 years younger than Bill Tilden, but his tenacity proved too exhausting for Tilden's ample talents. He was a member French Davis Cup Team from 1923-1928. 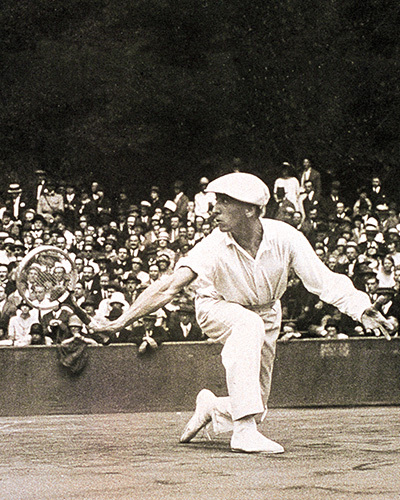 The high point of Lacoste's Davis Cup career came with the defeat of the United States for the 1927 championship. France held the cup for five more years. Lacoste's Davis Cup record was 32-8 in singles and 8-3 in doubles. Lacoste also wrote a tennis book in 1928, namely Lacoste on Tennis. He was a tenacious perfectionist, he had once been criticized by a coach for overtraining. His tendency to wear out practice partners proved so frustrating that Lacoste created the first the world's tennis ball machine, a hand-cranked device he called lance-balle. A studious tactician, he broke down his rivals with an unshakable methodology and clearness of purpose, flourishing in the late 1920s. Lauded for his dogged combative spirit, he recognized that he could not afford to leave any stone unturned in pursuit of his loftiest goals. During his career, he won 7 Grand Slam singles titles: 3 Roland Garros, 2-2 Wimbledon and US National Championships (the predecessor of US Open). He was the 44th Grand Slam singles champion of all time. 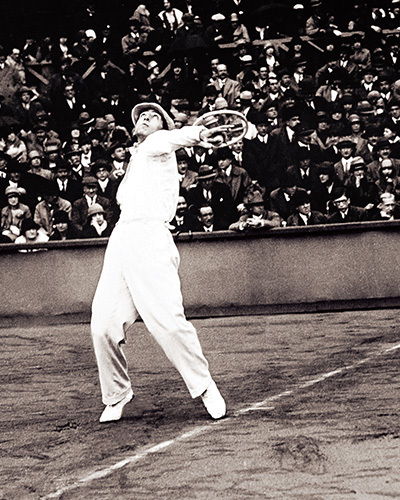 Three times he was runner-up in the Grand Slam finals (in 1924 Wimbledon, in 1926 and 1928 Roland Garros). He was the No. 1 of the world in 1926 and 1927 and No.2. in 1928 and in 1929. 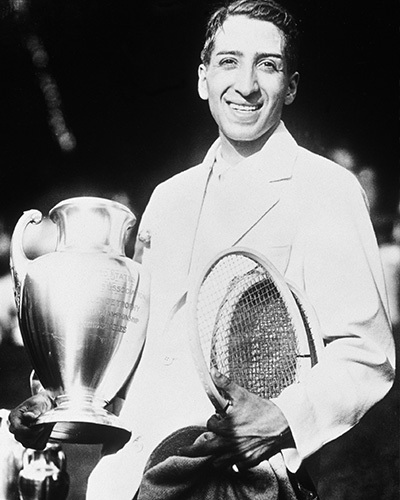 Lacoste won 3 Grand Slam doubles titles as well (Roland Garros ’25 and ’29; Wimbledon in ’25). He never took part in Melbourne at Australian Championships. He won 10 major titles and made 51 appearances for France in international Davis Cup competition in a career that lasted just seven years because of chronic health problems. Unfortunately, health problems derailed Lacoste's career and he was forced to retire prematurely in 1929. There are several explanations of why Lacoste was originally nicknamed the Crocodile. In the 1920s, Lacoste made a bet with his team captain about whether he would win a certain match. The stakes were a suitcase he had seen in a Boston store; it was made of crocodile skin. Later his friend namely Robert George embroidered a crocodile onto a blazer that Lacoste wore for his matches. As a player, Lacoste went against traditional on-court fashion, opting to compete in short-sleeved knit shirts rather than dress shirts. On June 30, 1930 he married the famous golfing champion, Simone de la Chaume. Their daughter Catherine Lacoste was a champion golfer. After leaving competition, Lacoste turned his attention to a variety of business projects. He founded the shirt company that bears his name and logo. 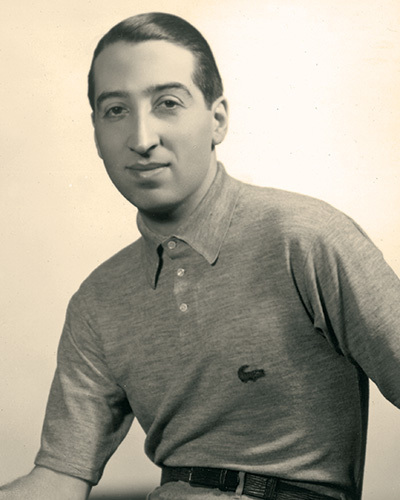 In 1933, Lacoste founded La Société Chemise Lacoste with Andre Gillier. The company produced the tennis shirt which Lacoste often wore when he was playing, which had a crocodile embroidered on the chest. By 1950, Lacoste's shirts, with its signature crocodile emblem on the left breast, entered the U.S. market. In 1963, Lacoste created a sensation in racquet technology by patenting the first tubular steel tennis racquet. Until then, racquets had almost always been made of wood. For the game of golf, he developed a new polyurethane driver, which helped the sport transition to composite material-based clubs. Between the mid-1960s and late 1980s Lacoste filed 20 new patents. His son, Bernard took over the clothing company in 1964. He was inducted into the International Tennis Hall of Fame in 1976. Lacoste name and symbol became synonymous with high status. Lacoste's clothing line was considered the height of preppy fashion in the 1970's and 80's. In 1982, sales peaked at $450 million. Over the last several years of his life, Rene Lacoste battled health issues. He suffered from prostate cancer and in early October 1996, had surgery on a broken leg. Four days later, on October 12, 1996, he died in Saint Jean de Luz in France. He passed away in his sleep from heart failure. He was 92 years old. Lacoste's legacy was evident in the style and demeanor of Bjorn Borg some 50 years later. This site would not have been completed without the tremendous support of LACOSTE S.A., LACOSTE Alligator S.A. et Sporloisir S.A. (Le groupe Lacoste). Photos courtesy of Lacoste S.A.
We wish to thank them for their generous assistance!